You'll find this cranberry salad on many Thanksgiving menus throughout the South. 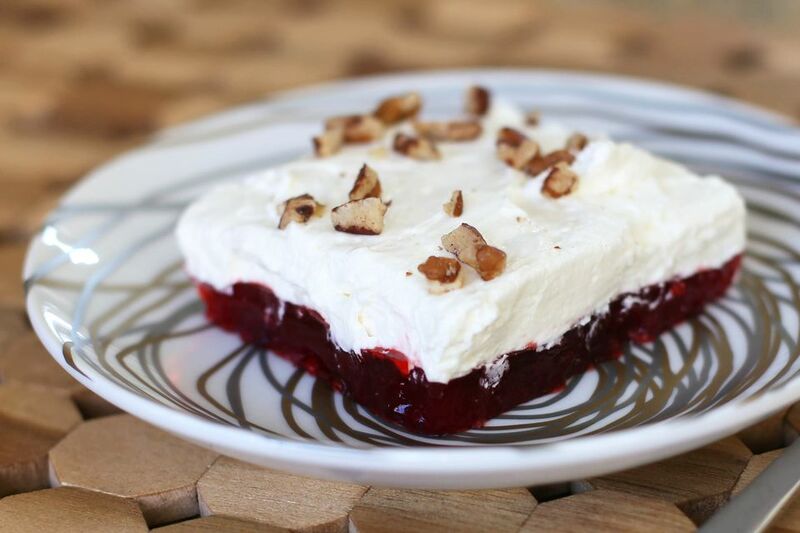 The "salad" is actually made with a layer of cranberry-flavored gelatin topped with a fluffy, lightly-sweetened cream cheese, and whipped cream. If you like an unsweetened topping, omit the sugar. Lightly oil a 9-inch square pan or spray with nonstick cooking spray. Put the gelatin powder in a medium bowl. Add 1 cup of the boiling water and stir until dissolved. Add the remaining water and the jellied and whole cranberry sauce. Stir until well blended. Pour the mixture into the prepared pan. Cover with plastic wrap and refrigerate for 1 to 2 hours, until firm. In a mixing bowl, beat the cream cheese with the powdered sugar (if using) until fluffy. In another bowl, beat the whipping cream until stiff peaks form. With the mixer on low speed, blend about half of the whipped cream into the cream cheese mixture. Fold the remaining whipped cream into the cream cheese mixture with a spatula. Spread the cream cheese mixture over the chilled cranberry gelatin mixture. Sprinkle with the nuts. To serve, cut into squares and lift out with a flexible spatula.